PPSP is thrilled to inform all Poky Pedalers that the 2015 Bike Fun Calendar has been released. The fourth year for PPSP includes 16 Poky Pedals from mid-May through late-September that will allow you to share more Bike Fun than ever. As always, all Poky Pedals are free and all Poky Pedalers are welcome to share Bike Fun as often as you wish. I will describe here some highlights that include new themes and old favorites. If you just can’t wait, click here to check it out immediately. In 2015, PPSP will initiate a new monthly series of family-friendly rides. The TGIF Dessert Rides will take place on one Friday evening each month from May through September. These Poky Pedals will start at 7 PM from the Mathias Mitchell Public Square in downtown Stevens Point and follow a 3-mile loop on the non-motorized path along the Wisconsin River to Bukolt Park and back. After getting our fill of picturesque riverside views, we will congregate at a dessert place near our starting location where Poky Pedalers can satisfy their collective sweet teeth. What a great way to start the weekend! To get a better idea of what to expect on the TGIF Dessert Rides, you can read more here. The Saturday afternoon ride in May will be an extraordinary opportunity for Bike Fun. The Bike to Shop Day Bingo Ride will take place on May 23. This ride will celebrate a counterpart to the more highly publicized Bike to Work Day and Bike to School Day. Our celebration will include a shopping-based Bingo game to be played over the course of the ride, and special one-of-a-kind prizes will be awarded to Bingo winners. The first Bike to Shop Day celebration took place in May 2014 in California. 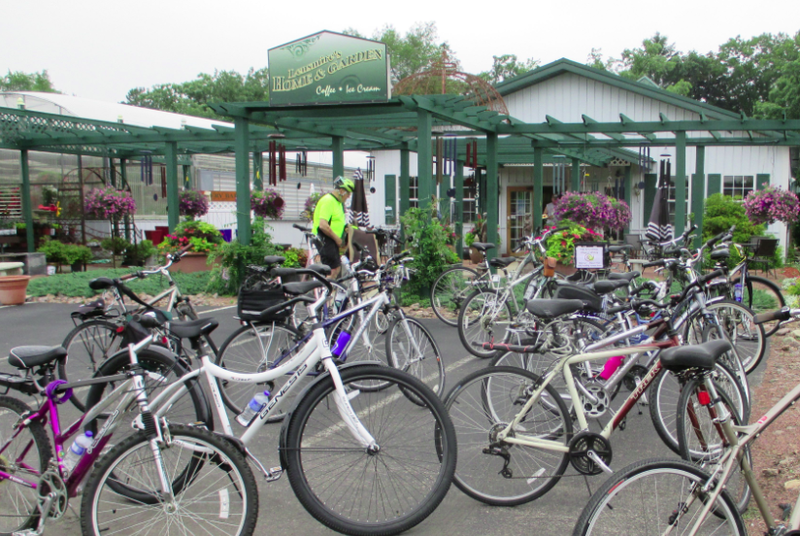 To my knowledge, Stevens Point will be the second community in the United States to celebrate Bike to Shop Day. Where else can you combine Bingo, bicycling, prizes, and nationwide fame but on the Bike to Shop Day Bingo Ride? Poky Pedalers will definitely want to share in this unique history-making flavor of Bike Fun. The popular Poky Pizza Pedals and Poky Pedaling Potluck Picnics will both be back for 2015. These two monthly Poky Pedals combine a delightful short bicycle ride with a delicious culinary experience. Poky Pizza Pedals occur on a Tuesday evening once a month from May through August. Each starts at 5:15 PM from Point Area Bicycle Service downtown and follows a 4-mile loop that is different on each ride. We return to a pizza place close to our starting location where we can partake of food and beverage together. You can learn more about Poky Pizza Pedals here. Poky Pedaling Potluck Picnics are on one Wednesday evening during the months of May, July, and August. We meet at 5:15 PM at Goerke Park and then ride between 3 and 5 miles to a mystery park location that is different each ride. At our destination, we will enjoy a splendid meal comprised of the picnic contributions Poky Pedalers have brought along on their bikes. 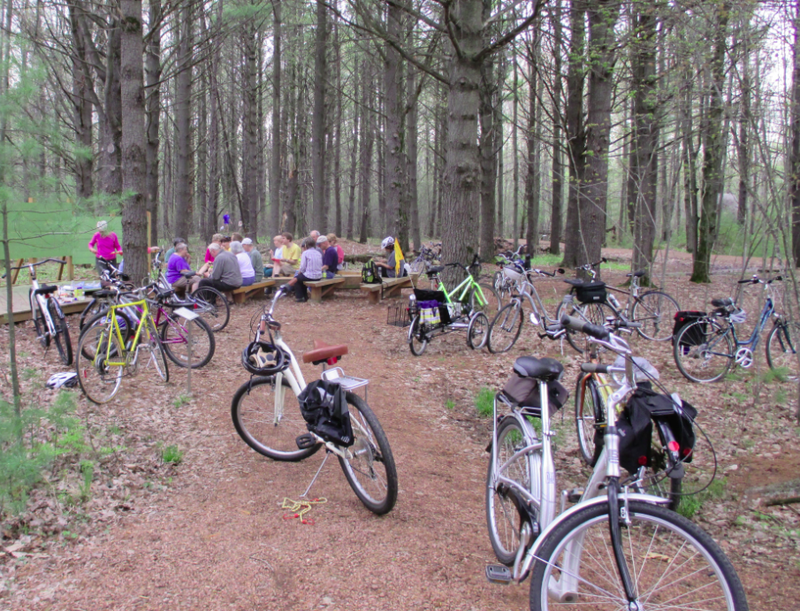 More info about how Poky Pedaling Potluck Picnics work can be found here. Among the Saturday afternoon Poky Pedals, there will be another Poke-Around Ride. This year we will explore the northern part of the village of Plover. The highlights of this 12-mile loop ride include a secret miniature golf spot, a DNR fishery area, and the most spectacular cul-de-sac in the county. There’s no telling where Poky Pedals might take us in 2015. Fortunately, Bike Fun can be shared anywhere. There will also be an encore of last year’s Bike/Ped Plan Vision Ride. This 11-mile loop ride will be an opportunity to learn about several kinds of biking and walking accommodations recommended for the Stevens Point area by the recently adopted Portage County Bicycle and Pedestrian Plan. 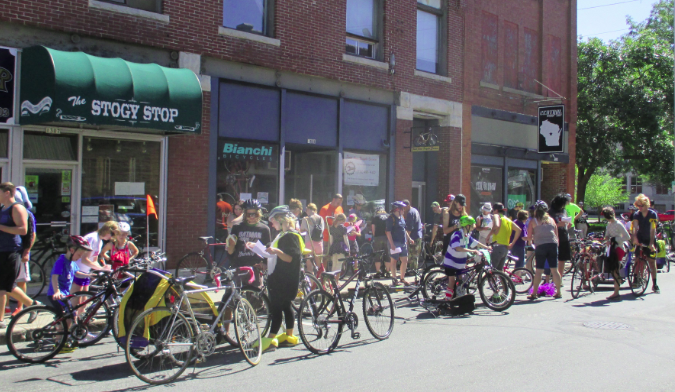 As always, the Maple Ride will close out our season of Bike Fun. During this 13-mile early fall loop ride, Poky Pedalers will enjoy a pleasant Saturday afternoon of bicycling in late-September as we seek out streets named “Maple” (in whole or in part). As an FYI to Poky Pedalers, I want to mention a couple of minor changes to how Poky Pedaling Potluck Picnics will be routed and how the 2015 Bike Fun Calendar is scheduled. First, Poky Pedaling Potluck Picnics will no longer stop at a food store on the way to our mystery picnic destination. This means that Poky Pedalers should plan on bringing their picnic contribution with them to the Goerke Park starting location. This change reflects that past PPPP requests to stop at the food store were infrequent. This change will give more flexibility in our routes and make more mystery park locations available within our 3- to 5-mile Poky Pedaling radius. Free your schedule for the 2015 Bike Fun Calendar. All Poky Pedalers, including Stevens Point Mayor-Elect Mike Wiza (right in blue shirt), deserve to share Bike Fun. Second, scheduling in the 2015 Bike Fun Calendar is irregular compared to past years. 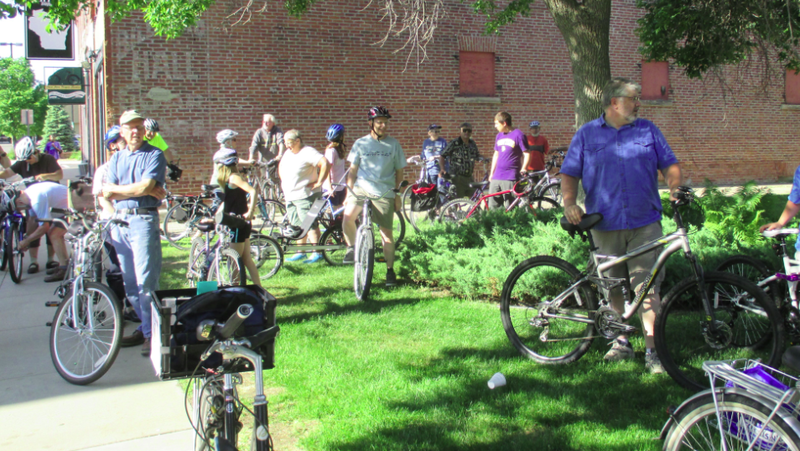 For example, Poky Pedaling Potluck Picnics will still be on Tuesdays, but will not necessarily be on the third Tuesday of the month. This irregularity results from my plan to be out of town for most of June and for several weeks in late August and early September. You can read this blog post to learn why I will be travelling away from the area during these spans. This is also why there will be fewer Poky Pedals in June than usual. In addition, I will not be present during the June Poky Pizza Pedal. I have arranged for a few Deputy Bike Fun Directors to step in and ensure Bike Fun thrives in my absence. If other Poky Pedalers are interested in the honor of being a Deputy Bike Fun Director, contact me via the form below and I can let you know how you can pitch in. The 2015 Bike Fun Calendar is your comprehensive guide to Bike Fun with PPSP. Take a look at it here to discover the days, times, meeting locations, and brief summaries of all the Poky Pedals to come. When spring blooms and temps rise, that means that Bike Fun with PPSP can’t be far off. Our first Poky Pedal is on May 13, so get your tires pumped. I look forward to sharing Bike Fun with all Poky Pedalers over the months to come.